Aldo Leopold wrote, “There are some who can live without wild things, and some who cannot.” Take Back Conservation is for those who cannot live without wild things, who are the heart and soul of the wilderness and wildlife conservation movement. For one hundred years this network of wildlovers has fought to save wild things for their own sake, and has worked to set aside National Parks, Wilderness Areas, and other protected areas as the strongest tools to save wild things. But now, this old network of wilderness and wildlife conservationists is being undermined and weakened by enviro-resourcists among funders, consultants, new staff leaders and board members who want to change conservation in these ways: Dump the ethic of wild things for their own sakes—save what is economically good; replace Wilderness Areas and National Parks with sustainable development; remake grassroots clubs into corporate institutions run by professionals; stop “doom and gloom” about extinction—don’t worry, be happy; make win-win deals with conservation foes; techno-fixes will save us. Above all else, enviro-resourcists say,conservation is about people, not wild things. In Take Back Conservation, Dave Foreman shows those who love wild things why and how they need to take back conservation. Second in the For the Wild Things series of 5 books by The Rewilding Institute. Standard shipping: $6 for the first book; $3 for each additional book. Priority Mail: $8 for the first book; $6 for each additional book. Canada/International Priority shipping: $16/$20. Individuals and conservation organizations may buy Take Back Conservation in bulk from The Rewilding Institute for resale or to give away. 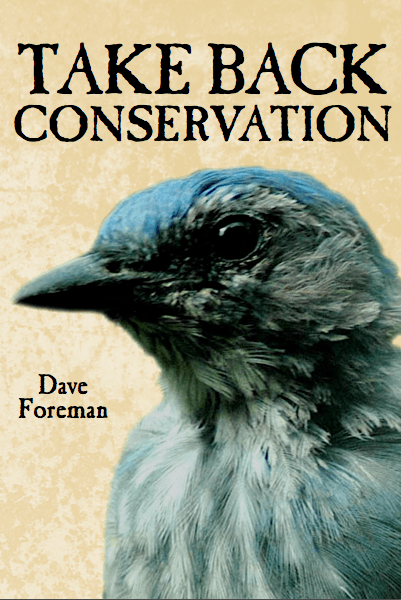 Bookstores and other commercial outlets may buy Take Back Conservation from The Rewilding Institute or from Raven’s Eye Press (www.ravenseyepress.com). Books are signed (unless you don’t want yours signed). Please let us know if you want it personalized and, if so, to whom. 1 The Myth of the Environmental Movement – The Myth of the Environmental Movement (that conservation and environmentalism are one movement) is debunked. How Nature conservation and resource conservation (resourcism) are unalike. Enviro-resourcism. 2 It’s Not Just About Whales Anymore – A deeper look at how environmentalism and conservation are unalike. How acknowledging that will strengthen both. Good environmental countries that are awful on conservation of wildlife and wilderness. 3 How Enviro-Resourcism Undercuts Conservation – Field marks of conservationists and enviro-resourcists. A sweep of ways, from techno-fix to ecosystem services, by which enviro-resourcists weaken and shift conservation away from its roots. 4 Meet the Enviro-Resourcists – Who the enviro-resourcists are—foundations, consultants and trainers, and new staff; where they come from; how they have sway; and tales of what each has done to undercut the personality, values, style, kinship, and toughness of the old wilderness and wildlife family. 5 Jumping Off the Fence: The Nature Conservancy – How and why The Nature Conservancy (TNC) has gone astray since 1990, turned its back on protected areas, and gotten into bed with multinational resource-exploitation corporations. 6 Society for Conservation Biology: Slipping Away from Protected Areas – How the Society for Conservation Biology (SCB) began as a scientific group with a mission to stop extinction by better design and stewardship of protected areas, and how it has shifted into an “international society for conservation professionals” through political correctness, loss of natural history, and careerism. 7 The Environmentalist Stereotype – The belief that environmentalism (and conservation) is a leftist, politically correct wing of the Democratic Party in the US is a strong and harmful stereotype. 8 Animal Rights, Hunting, and Conservation – The long tie between hunters and conservation; why many now think environmentalism (conservation) and animal rights are together and against hunting; why we need hunters to become well known as conservation leaders, and how to do that. 9 Conservatism and Conservation – Many Republicans once backed conservation. How conservation and traditional conservatism share underlying values, such as prudence, posterity, piety, and responsibility. 10 Conservation and the “Free Market” – Key steps for how sound, thoughtful free-market economics can help conservation and environmentalism in the fields of Regulatory Reform, Free Market, and Incentives. 11 Take Back OUR Conservation Movement – Wildlovers need to deal with the myths of the environmental movement and take back the conservation network for wilderness and wildlife from the enviro-resourcists. 12 Back to the Clubhouse: Organizational Steps to Take Back the Conservation Movement – A thorough look at steps to bring the makeup of the conservation movement back to its roots—reforms on image, outreach, organization, and funding. 13 Goods, Policies, and Work Reforms – A thorough look at steps to bring the work of the conservation movement back to its roots—reforms on values, policies, vision, and boldness. Hope for tomorrow.